Systems Equipment has announced a ‘big production’ version of its ADP-100 Asphalt Drum Mix Blend Computer. 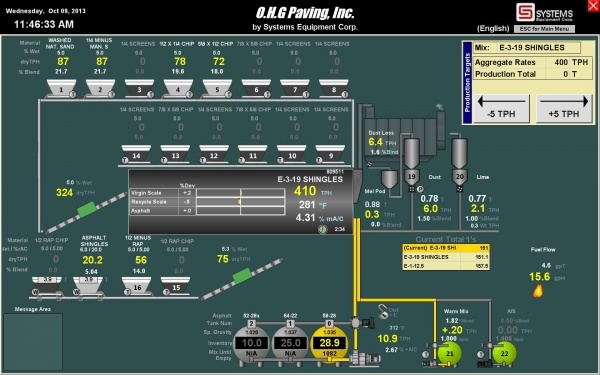 Launched in September 2017, this expanded version of SYSTEMS’ reputable blend computer controls up to 24 feeder channels for aggregates and additives, including fines, liquids and other materials used to produce drum mix asphalt. The base ADP-100 system on which this large-scale version is built was developed nearly 30 years ago. It was designed to proportion aggregates and additives according to prescribed mix design formulas, and also measures and controls the liquid asphalt mass flow rate so that blends are accurately interlocked to the measured aggregate flow. Duncklee says this robust system has the same bulletproof I/O that has made the parent ADP-100 so notable. “The new 24-feeder ‘S’ version of the ADP-100 will use the same rugged modules - it will simply be capable of handling many more of them,” says Duncklee. Besides the 24 feeders, the new I/O will handle 64 discrete inputs and outputs when required. In addition, this expanded system has room for an additional 20 analog inputs for metering various kinds of equipment - including pods, aggregate bins and liquid skids on load cells – as weight depletion feeders. “From depletion pods, leveling silos, impact flow meters, and even fuel-flow monitoring, the number of different control types in the ADP-100S is astounding,” says Duncklee. The ADP-100S also has new packaging, developed for easier connection to the equipment’s wiring. A new layout and cabinet design are suited to the large capacity of this system. The ADP-100S uses a graphic display, making data easy to interpret for plant operators. For example, feeders and asphalt tanks can be labeled with the material they contain and mix formulas can be labeled with logical names. Meaningful plant information is displayed in both text and graphic formats. Using the mouse, the operator can point and click on plant equipment images to directly access detailed operational, calibration and setup data relative to that plant’s equipment. The ADP-100S accommodates a trend toward a ‘glass cockpit’ approach to control centers, where computers replace manual push-button controls, gauges and hundreds of feet of wiring. Systems Equipment offers blend, loadout and silo/motor control systems with this clutter-free priority in mind, allowing operators to work more efficiently and safely in their environment. Systems Equipment is a leading developer and manufacturer of automation and controls for the asphalt and aggregate industries. The product line includes manual controls; blend, loadout, and silo/motor control automation; custom-built control centers; metering equipment; and belt scale and feeder components. For more information, call (563) 568-6387.